Patients and friends call the award-winning reproductive endocrinologist with shoulder-length gray hair “The Werl.” He treats about 45 patients a day at Corona and Irvine facilities where he serves as medical director. Werlin has garnered national acclaim for his research and successes helping infertile couples have babies. Dr. Lawrence Werlin M.D. 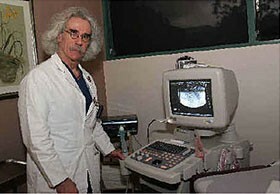 in an exam room with an ultrasound machine at the Corona Institute for Reproductive Medicine and Fertility. The Stones are part of his hipster style. He plays the rock band’s music in his clinics and owns “a lot” of Stones memorabilia. “I am an old rocker, just like them,” Werlin said in an e-mail. During an annual meeting next month of the Pacific Coast Reproductive Society, Werlin will present findings from a study of high-risk groups using preimplantation genetic diagnosis, or PGD. The conference will be held April 18-22 in Rancho Mirage. “PGD is an advanced technique that involves checking the cells through biopsy of a developing embryo for chromosomal abnormalities such as Down’s syndrome, or to identify specific single gene defects such as cystic fibrosis, Huntington’s disease, and sickle cell anemia,” Werlin said in the e-mail. High-risk groups are older female patients, patients who experience male infertility, recurring miscarriages, or two or more failed in-vitro fertilization cycles. Werlin served as principal investigator for the PGD study of high-risk groups. Researchers with the GENESIS Network for Reproductive Health conducted the studies. Werlin founded the network, a group of fertility centers and researchers from the University of California, Los Angeles, Stanford University, University of Southern California and other organizations. He is recipient of the National Fellowship in Reproductive Medicine and served as National Fellow in Reproductive Medicine at the National Institutes of Health. In January, Werlin launched a reproductive information blog called WerlsFertilityWorld.com. Werlin hosts the online interaction that has included discussions on preimplantation genetic diagnosis, simple surgery for male infertility, effects of smoking on infertility and use of embryonic stem cells in research. “I think that stem cell research offers new insights into potential therapies that can be beneficial to everyone,” Werlin said. His clinic’s lab does not sell stem cells, he said. Patients undergoing PGD to find abnormal embryos choose whether to donate the embryos to research or discard them, he said. During preimplantation genetic diagnosis, couples may also choose to select a baby’s gender. Technology does not yet allow eye and hair color and height to be accurately selected, Werlin said. Nearly 300 patients at the Coastal Fertility Medical Center in Irvine, where Werlin is medical director, have used PGD to screen for gene and chromosomal abnormalities in embryos. None have used PGD to determine a baby’s gender, he said. A consortium of researchers and the American Society for Reproductive Medicine are establishing ethical guidelines for the use of preimplantation genetic diagnosis. “My top concern about the future of reproductive medicine is that we continue to develop and utilize methods that will benefit out patients in a humane and ethical way,” Werlin said. Female patients at the Coastal Fertility Medical Center in Irvine, where Werlin is medical director, underwent 242 treatment cycles involving fresh embryos created from the patient’s own eggs. Of women patients undergoing this treatment, 34.9% age 35 and younger gave birth; 30.6% of women age 35 to 37 gave birth; 30.5% of women age 38 to 40 gave birth; and 13.2% of women age 41 to 42 gave birth. The Loma Linda University Center for Fertility and IVF, or in-vitro fertilization, reported birth rates for the same treatment cycles in the same age categories as 50.7%, 27.3%, 22.2% and 0/10, respectively. The university center is the only Inland Empire fertility clinic listed on the 2004 report. In February 2006 Werlin and Paul C. Magarelli, a long-time friend and reproductive endocrinologist, opened the Corona Institute for Reproductive Medicine & Fertility. The offices are housed in the Corona Medical Plaza on Fullerton Avenue. The clinic in September announced that five patients had achieved pregnancy, three through in-vitro fertilization and two through artificial insemination. The earliest delivery is expected next month, a release said. The Corona practice has treated about 145 couples since opening, Werlin said. Werlin and Magarelli share ownership of the institute and used their own funds to establish the practice. Magarelli is also medical director of the Reproductive Medicine and Fertility Centers in Colorado and New Mexico. Werlin declined to reveal their funding sources. The Corona center employs 10 people, including nurse practitioner Elaine Ishida, who has worked with Werlin 30 years. For a price that ranges between $300,000 and $500,000, Magarelli and Werlin are building a lab in the Corona facility that is expected to open in May. Staff will use the lab to perform egg removals and in-vitro fertilization. Currently, patients needing such treatments travel to the Coastal Fertility Medical Center. Prices start at about $700 to $1,000 for insemination procedures. In-vitro fertilization, the process of uniting eggs and sperm outside the uterus and transferring an embryo back into the womb, can average $8,000 per cycle not including medications. Preimplantation genetic diagnosis, conducted in concert with in-vitro fertilization, can average $4,000 per cycle. The Irvine center treats about 500 new patients a year. Approximately 10% of the center’s patients travel from the Corona area, Werlin said. Werlin and Magarelli founded the Corona enterprise after market studies determined there was enough demand in the area. “We found a young, growing population and they were just underserved,” Werlin said. In July, Werlin and Magarelli acquired the 15-year practice of Upland reproductive specialist Bert J. Hans Davidson, who retired. The “Werl” continues to roll after 25 years in the reproductive industry. Werlin attended medical school at Mt. Sinai School of Medicine in New York City. He completed an internship and residency at Harbor UCLA Medical Center.